Friends and family of Col. Joe F. Cotton, a longtime Atherton resident before his death in 2016, gathered in his birth town of Rushville, Indiana, yesterday to dedicate a bridge in his honor. Emails the Colonel’s daughter, Connie Jo Cotton: “There was a Cotton Alley for many years — we actually have the signs at [my folk’s] Atherton home from the Alley. 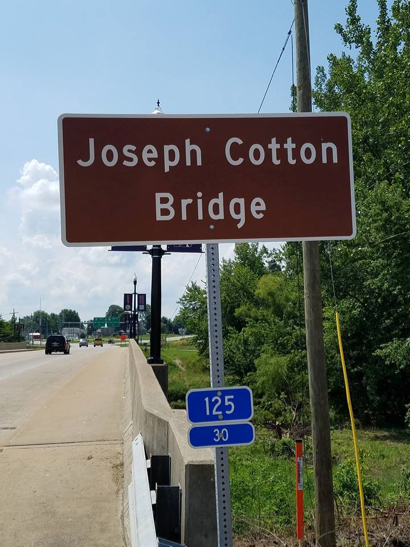 The naming of the bridge “Joseph Cotton Bridge” was initiated by a resolution presented to the Indiana state legislature by the state’s Committee On Roads and Transportation. A copy of the resolution listing Col. Cotton’s distinguished aviation career and his many accomplishments is available online. As a transplanted Hoosier, I was delighted to see Rushville come up in “In Menlo”. Think it’s wondeful that Col. Coton has been honored for his service to America in this way.